The Toyota 4Runner is a sport utility vehicle (SUV) produced by the Japanese manufacturer Toyota and sold throughout the world from 1984 to present. In Japan it was known as the Toyota Hilux Surf. 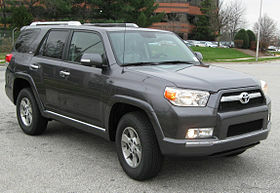 The original 4Runner was a compact SUV and little more than a Toyota pickup truck with a fiberglass shell over the bed, but the model has since undergone significant independent development into a cross between a compact and a mid-size SUV. All 4Runners have been built at Toyota’s Tahara plant in Tahara, Aichi, Japan, or at Hino Motors’ Hamura, Japan plant, and in Brazil. Its mid-size crossover SUV counterpart is the Toyota Highlander.